"Theri" has garnered good reviews from the fans of Vijay. 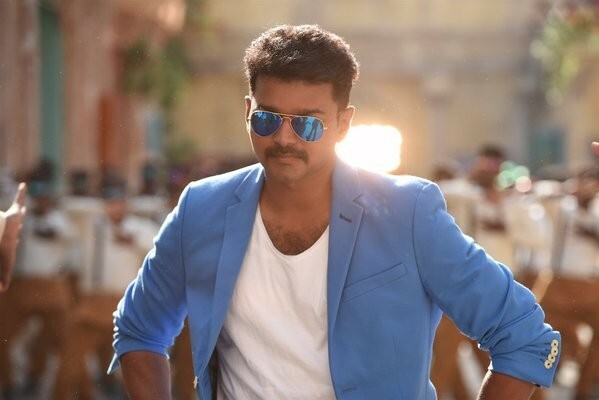 Vijay-starrer "Theri" has opened to fairly positive reviews. It is an emotional film, which has all the commercial elements that audience love to see in Ilayathalapathy's movies. The actor has teamed up with one-film-old Atlee Kumar for "Theri," produced by Kalaipuli S Dhanu. The movie has Samantha and Amy Jackson playing the female leads. Prabhu, Raadhika Sarathkumar, baby Nainika, Santhanam, Rajendran, Kaali Venkat and others will be seen in supporting roles in the flick, which has George C Williams' cinematography and Anthony L Ruben's editing. GV Prakash Kumar has provided a couple of good songs, and "En Jeevan," "Eena Meena Teeka," "Chella Kutti" and "Raangu" have become chartbusters. The story of the movie is about a good father versus a bad father. An honest cop Vijaya Kumar (Vijay) bids goodbye to his profession following a personal tragedy. He settles in Kerala with his daughter played by Nainika and rechristens himself as Joseph Kuruvilla. But wicked politician (Mahendran) does not allow him to lead a peaceful life and wants to kill the ex-police officer's daughter. What happens next is the best part of the story. "Theri" has a good subject and it is loaded with emotions. The story is also backed by punch dialogues and brilliant action sequences. But the screenplay is not tight and the film becomes predictable at parts. Vijay is a treat to watch in "Theri" in multiple avatars. Be it in action sequences or emotional scenes, the actor impresses the viewers with his acting. Samantha's chemistry with him works big time. Baby Nainika is equally good. Amy Jackson has done a different role altogether in the film and it is a welcome change to see her sans glamour. Mahendran is brilliant in the role of a villain, Naan Kadavul Rajendran and Raadhika Sarathkumar are good in their limited portions. The cinematography is top notch and the background score remains one of the highlights of the film. On a whole "Theri" is a complete family entertainer and has mass elements to thrill the fans of Vijay. The movie can be enjoyed for some fine performances of the key characters and a decent old-wine-in-a-new-bottle kind of story. Sidhu posted: #Theri: The main issue here is that you're always ahead of the proceedings, right from frame 1. Age-old predictable revenge-masala mix. #Theri: George C Williams is the actual hero of the film, bringing us bright visuals all the way. Nainika's dialogues - another highlight! #Theri: Tolerable. Atlee's story is old as the hills, but his new-gen presentation saves the day. Enjoyable first half, middling second. #Theri Interval: Jolly good fun. Nicely packaged crowd pleaser with terrific action and tardy emotions. Nainika - wonderful find! #Theri 3.25/5 Calling card #Vijay & #Nainika holds the uneven film together. Their cute antics are a treat to watch, films best moments. #Theri 3.25/5.1st half Fun 2nd half :Revenge drama. @Samanthaprabhu2 good done her own dubbing, @iamAmyJackson with her wig is a miscast. Ramesh tweeted: #Theri [3/5] : @Atlee_dir has packaged #Ilayathalapathy Vijay 's Mass with a message oriented story plus sentiments.. A gud summer watch! #Theri [3/5] : @gvprakash is another hero of the movie.. In particular, the BGM for Mass and Confrontational scenes are Theri..
#Theri [3/5] : @Samanthaprabhu2 gets a meaty role in a Mass Hero commercial movie.. Makes maximum impact in minimum time.. Looks great..
#Theri [3/5] : A Good Mass Entertainer.. An Excellent 1st Half.. A slightly hurried 2nd.. Good Msg.. Nice pkging with entertnmnt elements..
ChristopherKanagaraj tweeted: #Theri | Gud first half, felt its lengthy. Vijay - Nainika, Motta rajendiran portion super, Interval block sema, jithu jilladi song nt gud!! Commonman Sathish posted: #TheriBaby - Vijay's own daughter had done a small cameo.. Check it out in the last scene. #Theri - Fans, plz wait after the climax to watch bloopers & #Raangu song..
â€ª#â€ŽTheriâ€¬ - Engaging first half, MASS interval block & Predictable second half. Atlee has totally invested on Ilayathalapathy. Plot could have been better. #Theri 1st half @Atlee_dir has included sufficient commercial elements to satisfy @actorvijay fans, kids, ladies & family audience. #Theri First half- #Nainika - U beauty.. Completely overshadows Ilayathalapathy in the first 20 Minutes. Haricharan Pudipeddi posted: Loved the first half of #Theri. However, it all goes downhill post interval. You feel as though everything was wrapped up in a hurry. #Vijay has rocked in khaki, and although he's played a cop before, he makes Vijay Kumar character stand out with his histrionics. Praveen wrote: #Theri â€” On the whole, offers nothing new. But #IlayaThalapathyVijay's screen presence, mass moments & GVP's BGM stand out. Watchable once! #Theri - IlayaThalapathy Vijay comes with an outstanding-stellar performance.Too good after a clinker. Knockout acting in all his makeovers. #Theri â€” #RajaRani magic is missing, as story and treatment looks labored. The emotions and songs thrust into with a wafer thin storyline. #Theri â€” 1st half is engaging, Nanaika is too good with a great interval block,2nd half long drawn out & predictable end which is upsetting. #Theri â€” 2.75/5 Typical old school mix of emotional drama and action in Atlee's new style. Glossy packaged entertainer shouldered by #Vijay. Prashanth tweeted: #Theri interval - not bored even for a nano second. @actorvijay - mass overloaded!! @Atlee_dir - RESPECT !! Emotional and Joyful !! Done watching #THERI - best in @actorvijay 's career. Heartful and soulful. Worth every penny you spend. I'm very happy. #Theri has issues a common man faces. If you are a person who likes to be entertained. This movie is for u - MY VERY HONEST OPINION. #Theri 1st half - Otha Sollala moment is sure to thrill fans. #Vijay screen presence is terrific. His most convincing police look till now. #Theri 1st half - interval showdown bet #Vijay and #mahendran raises the tension.. Has all elements. Very entertaining so far. Rajasekar wrote: #Theri - yes, second half was predictable and the story is wafer thin but Vijay's screen presence and packaging were good. #Theri first half - @gvprakash 's stellar BGM is big plus. Thumbs up to @george_dop as well ! #Theri first half- Ilayathalapathy, whattey screen presence man. Pinni Pedal, after #NEP, this is @Samanthaprabhu2 's best. Surendhar MK posted: Amidst all the formulaic entertainers Vijay has done in his career, #Theri surely stands out. It could have been much much better though.